I am Diné, an American Indian. Not the Indian princess of a Disney movie, not the enemy combatant in a Western film, not the romantic, stoic relic of an old Edward Curtis photograph. I was born and raised on the Navajo Tribal Reservation, where my grandparents plied traditional knowledge but at the same time shared with me the importance of a white man’s way of life. In this day and age, they told me, finding a balance between the two is crucial to your own path. But it wasn’t until I left the reservation that I came to understand my purpose as a Diné woman. Growing up I experienced both cultures every day—sometimes separately, sometimes tightly interwoven, like the strands of wool in a Diné blanket. At school I learned Western ideology. Meanwhile my grandparents, our family’s keepers of the Diné legacy, imparted Navajo history and culture, taught me that I am born to the Tachii’nii clan (Red Running into the Water, my mother’s clan), and born for the Ti’aashcí’í clan (Red Bottom People, the clan of my father). On Sundays we worshipped at a Christian reform church, where sermons, spoken in the Navajo language, gave thanks to both the Creator of Life and the Lord Jesus Christ. 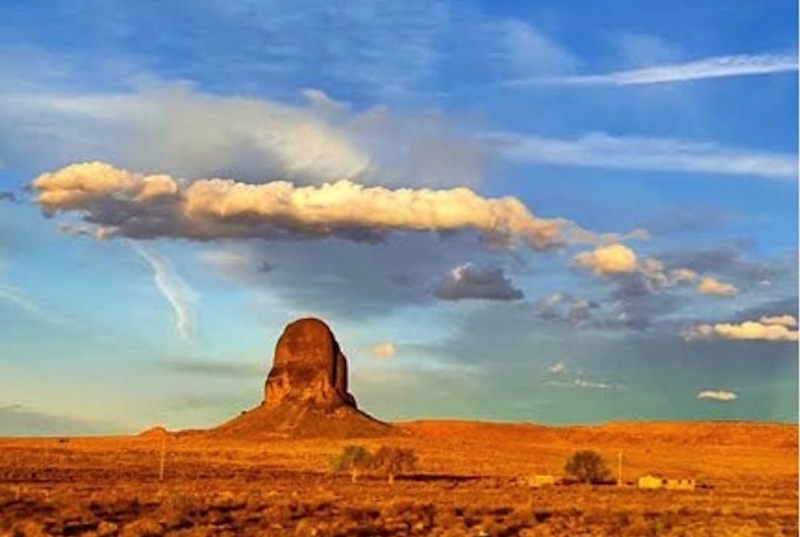 The Navajo Nation, whose settlement in the Four Corners of the Colorado Plateau extends back centuries before Christopher Columbus, is today by far America’s largest Indian tribe, with more than a million members—some identified by tribal status, others through family clanship. Diné Bikéyah, or Navajoland, encompasses more than 27,000 square miles across Utah, Arizona, and New Mexico—larger than 10 of the 50 states. My parents grew up around policies created by the U.S. government and other settlers to eradicate Indian culture. They met at Intermountain Indian Boarding School, where, they told me, they were compelled to embrace Western ways of life and avoid Indian culture because it would not help them or their children. But they made a conscious effort to maintain their traditional identities, even as circumstances compelled them to adapt to western social norms. They eventually married in a traditional Navajo wedding ceremony on the reservation, but later moved to Oakland, California, as part of the federal Indian Relocation Act of 1956. However, jobs were scarce in the city and my parents soon moved back to the reservation, which is where I spent my formative years. Peters with her grandmother, who passed away in 2008. 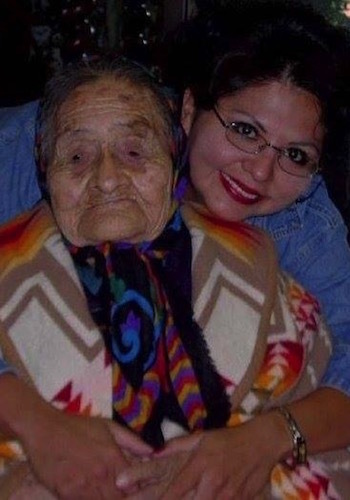 My mother’s path was to be a caretaker of our people, working as a dorm aide at a local boarding school for the Bureau of Indian Affairs, which also entitled our family to subsidized housing. The place was small—my parents in one bedroom, one of my sisters and her husband and daughter in the other room, and me on the old couch. But it was homey. The decor reflected my parents’ personalities. The corners were stacked high with copies of the Navajo Times that my dad never wanted to throw away. Blankets were piled throughout the house, my mom’s way of letting visitors know that despite close quarters there was always a comfortable place for guests to lay their heads. On the walls, rodeo posters hung alongside intricate Navajo sand paintings and flea market prints of R.C. Gorman’s Navajo women. On the weekends I would travel 100 miles to visit my grandparents, who lived in a traditional Navajo hogan as they always had, observing the mores of their ancestors, without electricity or running water. On walks, my grandmother taught me the bounty of the desert. Juniper berries for medicine. Yucca roots for natural soap. Greenthread herb for Navajo tea. Once, when a horned toad climbed on my foot and startled me, my grandmother told me not to harm it. Horned toads, she told me, are grandfathers of the arrowheads: if you kill them you will get sick and someone close may die. After that, I watched and followed the toads whenever I could, fascinated by their morbid power. I was drawn to their strong and clear purpose when I myself felt so powerless, and—as the years passed—purposeless. As a very young child, it didn’t occur to me to question my family’s bi-cultural way of my life. But that changed when I was six. My mother and I were in our local border town of Farmington, New Mexico, and I had to go to the bathroom. As we walked past the town’s white restaurant, I saw a bathroom sign through the window, so I ran in. Almost immediately I felt a firm grip on my arm. I looked up and there was a woman—white, frowning—asking me sharply where I was going and then yelling at my mother, asking what the hell she was doing and ordering her to leave with her dirty child. The memory is a blur of voices, but I remember the pain in my arm and the embarrassment as I stood there while the grown-ups argued, the urgency of my physical need ever more pressing, until I peed my pants. I came to expect the slights and insults, though I never got used to them. Years later, as a teenager, I remember driving home with two friends after a movie when two trucks full of white dudes suddenly appeared. They followed us to the rez border and then turned around. We felt hunted on our own land. When I was 15, I was assaulted, and, in a separate incident, my best friend was brutally murdered. Two other friends were killed in alcohol-fueled incidents—one was walking around drunk and was struck by a car, the other was hit by a drunk driver. These horrors left me in deep despair. I numbed myself with alcohol, and I attempted suicide. The problem with the depiction of Indians in media—the romanticized portraits and Disney-fied portrayals—is the lack of understanding of our history as actual people, Indian people. The year I graduated high school, I was working at the local KFC and living in the family apartment. But I had recovered just enough from my earlier traumas to know that I had to leave. Early mornings in the apartment were peaceful. Before my niece woke up and Sesame Street blared from the television, I would help my mother make breakfast, the aroma of desert sage wafting in through the windows, blending with the tang of coffee and spam potatoes. One morning, while we waited for the biscuit dough to rise, I told my mother of my plans. “Oh, Shi’awéé’—my baby—why do you want to leave?” she asked. In that moment, I wavered. What would I be leaving behind? The red, dusty earth and scorching heat of my ancestors. The fresh pine trees, sweet sage, and smoky creosote bushes that brought reassurance, exhilaration. My birthright. In college I made the most important realization of my life: The problem with the depiction of Indians in media—the romanticized portraits and Disney-fied portrayals—is the lack of understanding of our history as actual people, Indian people. Through studying other tribal communities, I rediscovered who I was as a Navajo woman, and, with that, my purpose in life: I would become a storyteller as my grandfather foresaw. My mission: to portray the realities and complexities of native communities. Today my multimedia work explores the lives of real American Indians, not ethnographic ephemera. While traditions are constantly changing, I understand the strong ties I have with my culture and understand why we must maintain them as Diné people. I am grateful to be able to transform my experience into art. Pamela J. Peters is a Los Angeles-based multimedia documentarian and a culture and native talent consultant for film and television. *Lead photo courtesy of Dory J. Peters. Interior photo courtesy of Pamela J. Peters.